‘Every artist is a cannibal…every poet is a thief’ declared U2 in ‘The Fly’. In 4th century, many children worked to support their families. St. Nicholas or ‘Sinterklaas’ in Dutch (pictured here) made secret donations to children, as he believed childhood should be enjoyed. Assisted by Zwarte Piets, St. Nicholas arrives by steam boat from Spain, distributing gifts & canes to naughty children. Baring a close resemblance to Santa, he’s dressed in red & white sporting a bishop’s hat. 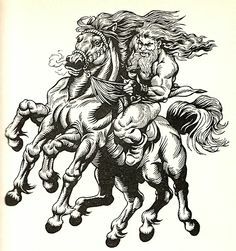 In Norse mythology, the 6th century God Odin led a hunting party with other gods on Yule, riding an 8 legged horse, Sleipnir. The 8 legged horse would later inspire the sleigh pulled by 8 reindeer in the sky. Christmas stockings by the fire was no doubt inspired by this legend, as Norse children would fill their boots with carrots and hay by the fireplace. This was for Sleipnir to eat on the journey. In return, Odin left treats and small presents in the boots, for the children to find the next morning. 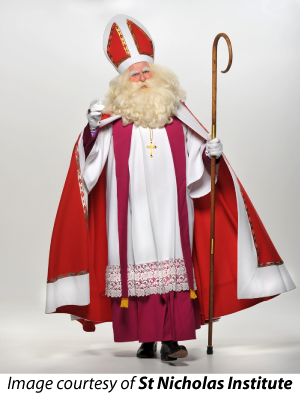 In the 18th century, US Americanised Sinterklass to Santa Claus. Then in 1823, US poet Clement Clarke Moore first combined both legends in the poem, ‘Twas a night before Christmas’. There’s no recorded date for the birth of Christ. However. the festival Saturnalia(aka Yule) was held on 17th December, for Roman god of agriculture, Saturn. In the latter days of the Roman Empire, the “Birthday of the Unconquerable Sun” was added in on 25th December. As the Roman empire came under Christian rule, in the 4th century, this day was rebranded Christmas. During Saturnalia, children gave wax dolls as gifts, to represent past human sacrifices Rome had given to Saturn in payment for good harvests. Harvest wreathes date back to ancient European animists for good harvests. Using evergreen in wreathes symbolized strength and fortitude, as they will live through even the harshest of winters. Similarly, the evergreen tree is found in Egyptian, Chinese, Hebrew, European druidism and pagan culture. First decorated with edibles(apples, nuts etc), non-edible decorations started with German craftsman guilds during the Renaissance. Trees became popular with Protestant households as an alternative to the Catholic nativity scene. Hymns started in 4th century Rome. ‘Carols’ began in 13th century France, Germany and Italy. Conglomerate holiday songs, written in the local language, they were sung at various festivals and celebrations. Only later were they exclusively associated with Xmas. X is the first letter in the Greek word for Christ (Chi). First used in the 16th century, Xmas gained prominence in the 18th & 19th centuries. As service staff were on duty on Christmas Day, employers gave them the next working day off and a box containing small gifts or leftover food to enjoy with their families, the generous blighters. This parasitic plant was considered sacred by the Norse, North American Indians and Druids who hung them for protection against thunder, lightning and other evils. Earliest evidence of mistletoe being associated with kissing dates back to 16th century England. What Did New Labour Do For Us?